Cymbalta is an antidepressant that possesses a strong anxiolytic and analgesic effect. 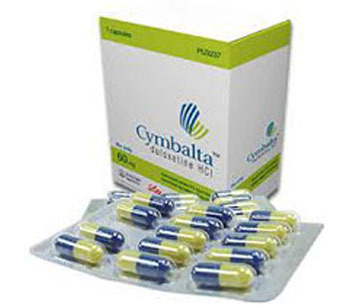 Three dosage strengths of Cymbalta can be usedfor treatment of neurological and mental diseases: 20 mg, 30 mgand 60 mg.
Cymbalta is available in the form of delayed-release capsules. Cymbalta capsules contain Duloxetine as hydrochloride (HCl). during the first week of generalized anxiety disordertreatment, it is recommended to take one 30 mg Cymbalta dose per day. If the need arises to increase the anxiolytic or analgesic effect of Cymbalta, the daily dose may be increased to a maximum of 120 mg. Depending on the intensity of the disease, the duration of the Cymbalta course can vary from one to several months. Patients with a history of mania, bipolar disorder, or convulsive syndrome may require a titration of Cymbaltadose. Patients with mild to moderate renal disease may take Cymbalta without dose adjustment. Combined use of Cymbalta with such drugs,as Fluvoxamine, Tianeptine, Tramadol or Pethidine increases the risk of adverse reactions of this antidepressant. Cymbalta administration concomitantly with these medications or their analogs is not recommended. A decrease in Cymbalta dose may be required when it is used in conjunction with Tolterodine, Desipramine, Warfarin, Flecainide, Metoprolol, Propafenone, or Risperidone. Because of the high risk of drug interactions, patients can start taking Linezolid or Moclobemide drugs no earlier than 5 days after the end of Cymbalta treatment. Side effects of Cymbalta are mild in nature, and quickly pass with further use of this antidepressant. Frequent side effects of Cymbalta are dry mouth, dizziness, headache, drowsiness and increased appetite. At the beginning of treatment, Cymbalta capsules can cause aggressiveness or orthostatic hypotension. Sharp termination of Cymbalta course increases the risk of such withdrawal symptoms, as insomnia, nausea, vomiting, anxiety or diarrhea. To avoid withdrawal symptoms, Cymbalta treatment should be ceasedgradually. The daily dose of Cymbalta should be reduced for approximately 14 days. The use of Cymbalta for the treatment of mental disorders in young adults can increase the risk of suicidal thoughts. Young patients with depression or anxiety are advised to attend counseling by a psychologist, while using Cymbalta. In a high likelihood of glaucoma, patients with musculoskeletal pain, diabetic neuropathy or mental disorder should use Cymbalta with caution. In the presence of cardiovascular diseases, in particular hypertension or arrhythmia, it is recommended to regularly check blood pressure level during the course of Cymbalta.